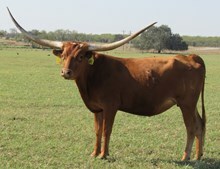 A BIG THANK YOU TO BILL AND JUDY MEREDITH FOR THERI PURCHASE OF THIS AWESOME LONGEST HORN COW TO EVER SELL AT PUBLIC AUCTION1CONSIGNED TO 2016 HUDSON-VALENTINE FALL SALE - OCV There are not enough descriptive words in the dictionary to describe how amazing this cow is. Over 92" TTT hard twist, great producer, double bred starlight. 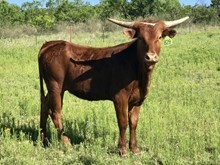 Sired by the late Tejas Star. Proven track record. We have collected some embryos off of her and her impact will never leave the partners individual operations. 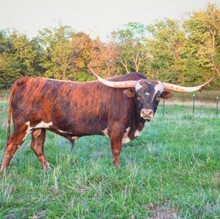 One of the greatest longhorn cows to grace the sale ring. Millennium Futurity Eligible.